“I will lend you my voice, said the crocodile god, but you must return it to me at this time tomorrow. The dog agreed and went away singing the praises of the crocodile god. “But the next day the dog never returned, and stole the crocodile’s voice. Now mute, the crocodile was cast out from his position of importance, and returned to live on the fringes of society, hiding his face below the murky depths. Ernesto sat back and drew deeply from his crocodile tooth pipe. Now eighty-two, and his hunting years long behind him, Ernesto hasn’t much to show for the life he led. Content to see his family provided for, the only remains of the thousand-plus crocodiles, jaguars and other exotic animals he had brought in from the bush are a few teeth kept in a shoebox under his bed. 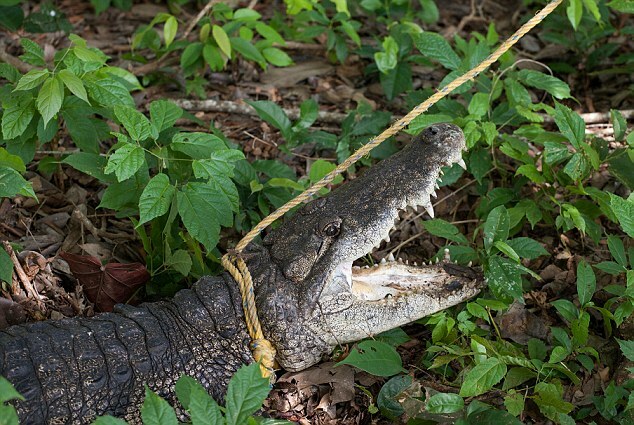 Pushing his shotgun aside he pulls out one of the hollow canines that the crocs shed and regrow every year. Tapered to a hardened point, he had pulled it from a large reptile after blasting it in the head twenty years before with his trusty shotgun. We had spent the afternoon with the rest of Ernesto’s community, which, shying away from the federal crime of poaching, is following the government-back scheme of taking half of a batch of eggs from a female – an extremely dangerous business in itself, since a female doesn’t sit on top of her nest, rather hides nearby and watches, springing out upon any would-be thief with lightning speed. This way, they say, the croc population won’t be damaged, as juvenile reptiles in the wild don’t have a good chance of survival anyway. Gliding across the dead-still waters in a canoe, the villagers told us crocodiles attacking their boats happens occasionally. Particularly on their way back from a raid. Landing on crocodile island itself wasn’t reassuring. The enormous nests, each belonging to an adult female, were some large – some a metre in height – and the villagers set up an outer perimeter, with nothing but sharp sticks pointed outwards to ward off any oncoming mother protecting her eggs. “You’ve got to hit them between the eyes, while your friend jumps on its back and clamps its mouth shut,” was the advice in my ear. We finished the day with a lot more information, but still no crocodiles, and I saw by the lake in Bacalar, the different shades of blue in the crystal saline waters altering with the sunset, thinking how to bring back something better. We had nothing scheduled the next day, and over breakfast I spoke with my photographer. I sipped at my coffee and grabbed a pinch of scrambled eggs between a ripped piece of tortilla.